The New Richmond Exempted Village School District is well on its way to becoming a fully digital school district with the addition of 450 Chromebook laptops for 2015-2016 school year. "It is a part of our strategic plan to 'provide high quality instruction' and to 'cultivate knowledge networks to become college and career ready,'" said NREVSD Supt Adam Bird. "Our students are growing up in a digital age and our students deserve the best resources that we can provide for them." New Richmond High School senior Brianna Gonzalez uses a Chromebook while studying in the high school media center. New Richmond started buying Chromebooks (which cost one-fourth of the price of a desktop computer-monitor combination) prior to the 2014-15 school year when the majority of the district’s aging PCs needed upgrading. Chromebooks range in price between $150 and $225 which is less than half the price of an Apple iPad, plus they have keyboards and touchpads which are critical for use in courses and assessments that require composition. New Richmond’s Chromebook program targets grades 3-8 due to newly adopted curriculum requirements for those grade levels in Science and Social Studies and for mandated online assessments. "We're excited that our entire Middle School will now be 1:1 with students (404) and devices (Chromebooks) beginning in 2015-2016 and approaching 1-1 for grades 3-8 (1132 students),” said NREVSD technology director Matt Prichard. "Adding these new Chromebooks presents a wonderful opportunity for our students and teachers to align daily curriculum and lessons with technology use in the classroom daily." 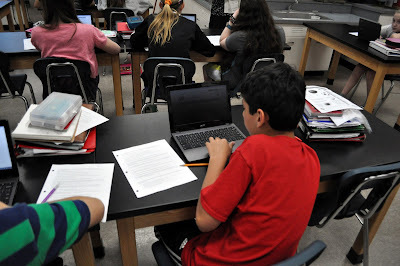 New Richmond Middle School now has a 1-1 ratio of Chromebooks to students. Chromebooks are inexpensive laptop computers running Google’s Chrome operating system that offer a quality and inexpensive technology option for schools by providing cloud computing, portability, long battery life, centralized management with no software charges. Chromebooks run Google Apps for Education which gives the district the benefit of Google Docs, Gmail, Google Calendar, Blogger, Sites, and much more, all for no cost to the district. “We have migrated to Google Apps for Education so we already receive the wonderful benefit of Google Docs, Gmail, Google Calendar, Blogger, Sites, and much more, all for no cost,” said Prichard. The additional Chromebooks bring the district’s total to 1450 and allowed the transfer of enough iPads to grades K-2 to achieve a 1-1 ratio of devices to students (577). Chromebooks lead to less ‘listen-to-me’ lecturing and more active student involvement in the classroom. Students work independently or in partners in the virtual labs, conducting experiments in a virtual environment with all of the same expectations for scientific application that their parents experienced in senior high school science labs. While New Richmond High School isn’t near a 1-1 ratio of devices-to-students, students are permitted to bring their own computer devices (cell phones are banned).